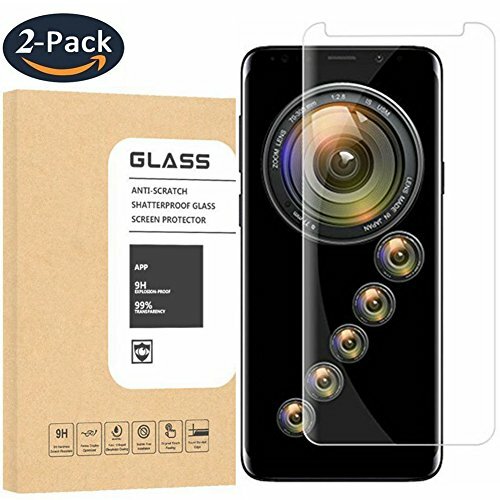 By undergoing more than 4.5 hours of high temperature temper treatment, this screen protector's compression strength reach as high as 125MPa, 5 times higher than regular glass. 9H Hardness, harder than a knife's blade. it is not exaggerated to say this screen protector is terminator to any possible scratches by keys, knife or other sharp objects. 99.99% transparency preserves the original screen brightness. You can enjoy a great viewing experience with more brightness and less glare. Only 0.25mm thickness maintains original response sensitivity, which ensures quick app launch, smooth games and video playing. The hydrophobic oleophobic coating largely reduces smudges and fingerprint. You keep your screen clean by a simple wipe. [3X Stronger]: This Huritan screen protector can withstand 11lbs. of force and protects the screen from damage. [HD Clarity]: 99.99% transparency, Ultra-thin only and oleophobic anti-smudge. [9H Hardness Surface]: Anti-scratch 0.3mm ultra thin Rounded Edge design with High-Definition Clarity. [Oleophobic Nano Coating]: Creates an oil resistant, anti-fingerprint surface that is easier to clean and protect against dirt, dust and sweat effectively. [Please Note] The screen protector provides the maximum protection for your phone touchscreen. The space between your phone and the screen protector enables the proper space for the installation of most phone cases. If you have any questions about this product by OLINKIT, contact us by completing and submitting the form below. If you are looking for a specif part number, please include it with your message.